I have one regret ― that I did not come out of the closet sooner. For over 50 years, I have explored the other side of the gender divide, but I have only been out of the closet for about 10 years. During the first 40 years, my female presentation was limited to home, support group meetings and transgender conventions, which were all closets in one way or another. In my mind, I stepped out of the closet when I began doing outreach and flying solo in public as a woman. Once I was out of the closet, I realized that I should have gotten out sooner... much sooner. 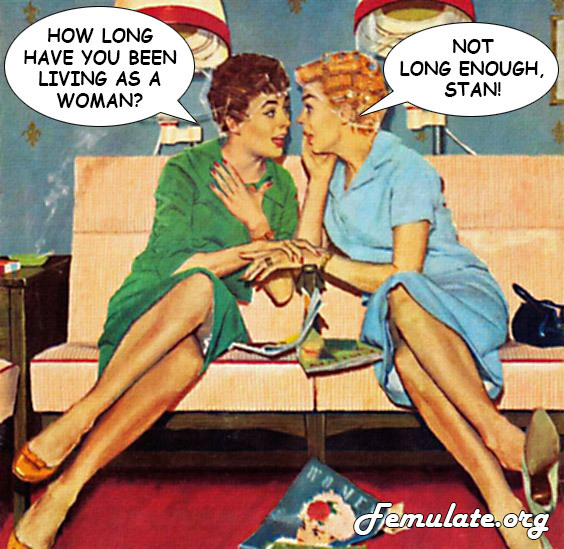 It was so wonderful to live as a woman and it was so much easier than I ever imagined. That's what kept me in the closet ― I thought it would be too hard, if not impossible to navigate society as a woman because I was too tall and that would give me away. But I was so wrong. Either I passed successfully as a woman or our society has become so nonchalant about dudes who dress like ladies, that no one minded me being their presence. Ether way, it was a win-win situation. So I urge anyone who is on the fence to get off the fence. Sitting on the fence is not very comfortable, whereas living as a woman is the most comfortable place in the world to be. 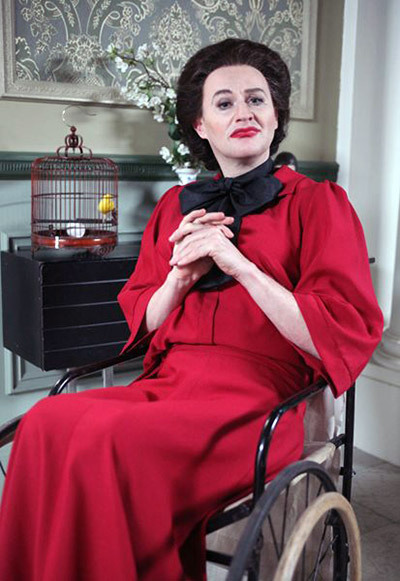 Mark Gatiss femulates Joan Crawford in UK television's Psychobitches (2013). I, too, used to worry about femulating among the civilian population, mostly because of my height. At my peak, I was 6'1" in bare feet. When I was 40 years old and younger, the average height of full grown USA males was 5'9", so at 6-1 I was 4 inches taller than the average male and probably at least 7 inches taller than the average female. I'm now 71 years young, and my barefoot height is now down to 6-0, due to normal age-related shrinkage. The average male USA height is now about 5-10, so I'm now only about 2 inches taller than the average USA guy, and maybe only 5 or 6 inches taller than the average USA woman. And, like you, I have discovered that only a tiny percentage of civilians give me an odd second look, even when I'm wearing 3" pumps. I gave up worrying about my height when I discovered that I was ideal for a Moulin Rouge showgirl according to one of their talent scouts (175cm, 5'10"). Now I just need to work on my other problems (too old, too bald, too pot bellied)before I send in my job application. So well said. Anything we can do to encourage others to get out so is important.